Hi y'all! I'm participating in my first ever game jam which I found over at itch.io. Simulate anything you want, whether it is a planet sim, or some particle sims or maybe simulating Civilizations and the Fermi Paradoxes. Submittion starts at 31st of August and you'll have one week to make 'em happen. And 5 days for voting and will end at 12 of Semptember! 3. Time travel sims are allowed. 4. put as much effort as possible, because anyone could vote for your game. 5. Game should be free, for people to test. I'm creating a weather simulation with clouds, a mountain, and water. Keeping it simple while I test out the Gamemaker physics engine for the first time. Time is over. Only 4 people submitted. 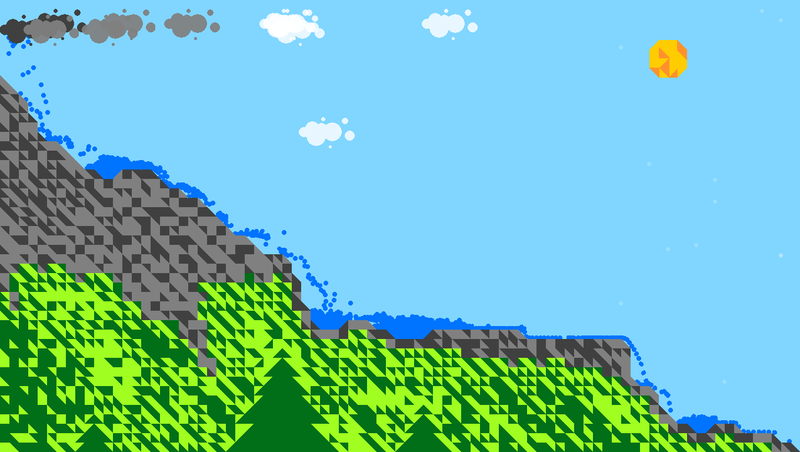 Here's my game Waterfall Mountain. A relaxing waterfall simulation with boulders crashing down the slope (optional).